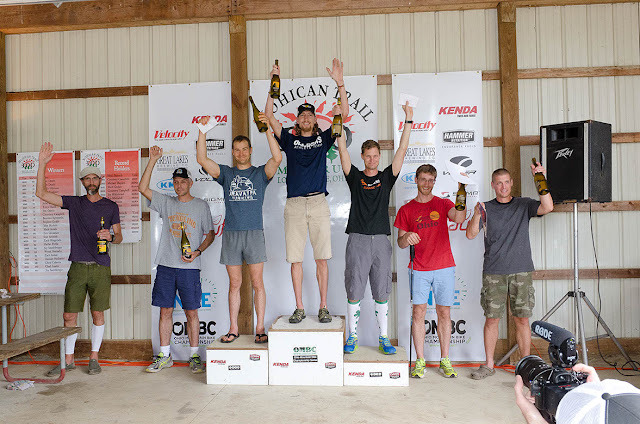 The Mohican 100 Mile Trail Run is an event I had been looking to run since I started running ultra marathons in 2010. The long history of the race (26th year and "5th oldest ultra in the US"), being located just 3 hours from where I live, not to mention the superb forest the course runs through, made it a fine choice for a summer 100 mile this year. With Mohican State Forest being a short drive, and in Loudonville, where many of my grandpa's side of the family still reside, I had a full force of family members that were able to support me and enjoy their first ultra experience. My wife, baby daughter and I also had a bed to sleep in with great hospitality and meals from my Aunt Judy who lives literally just 2 miles from the race start. This aspect of the weekend was awesome and made it a memorable one. I was also looking forward to being a part of a race that was going on its 26th year (a long time for 100 milers). A race with history always embodies the aspect of trail and ultra running that I enjoy. 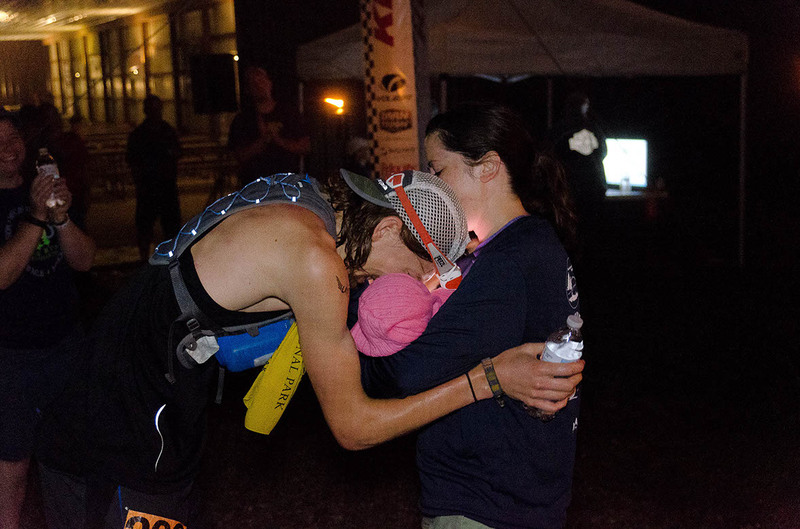 There are stories, people, and moments through the years of these races that make it special. Surely, more races will start building on their own history, but these "old" ones might last to be most historic. The course was altered in 2010 from the original one, now including 95% trail -cutting out some road sections of past- on 4 repeating loops (two at 27 miles and two at 23 miles). The old course is reportedly much faster with some road sections, so Courtney Campbell's CR at 15:11:00 seemed out of reach. My plan was to work on how I felt, crunching numbers in my head, and try to stay consistent all day long and execute on not just pace but fueling and hydration. The race morning was a cool and wet one. The original mid-90's forecast of a typical Ohio summer became more mild as the race approached, but it also brought in rain. After a conservative start on 1 mile of pavement through the park campground we entered the smooth lush singletrack that we would be on for 95% of the race. Nate Polaske started much faster than the rest of the race and he was out of site when we entered the trail. I was running behind two more runners in 4th but within 3 miles I excused myself around them and was just behind Nate. This early move foretold a tale of the next 18 hours of the day. 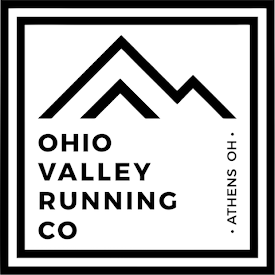 While Mohican is one of the oldest 100 milers in the US, there are typically only a handful of runners that break 20 hours. I knew this - I wanted to be one of those runners in this years race - but I always knew in the back of my mind that it could be any number of people running any time. 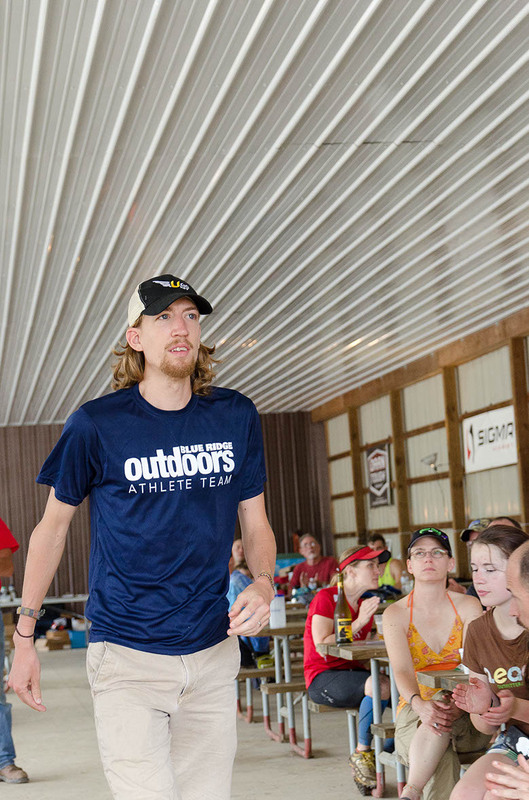 I settled into "my own race" at a pace that was comfortable for 100 miles. The rain was coming down above, but the dense forest kept me dry. It was wet, but not bad at this point, and I was enjoying the forest with firm trails. A deer dashed across the trail ahead of me, birds sung their morning songs as the sun started streaking through the trees. For several miles I felt as if I was on a typical Saturday morning run with the group in Athens - fresh and easy. Coming into the Fire Tower AS at mile 9 I caught a glimpse of Nate and soon after I slipped by him to be in the lead. I didn't necessarily want to be leading a 100 mile race at mile 10 - I had envisioned running with a small group of guys with the pack dwindling, but now I was alone with 90 miles ahead of me. I pressed on and opened up my stride when the course allowed, on what was still firm trails in the rain. I enjoyed the far side of the long loop when the trail went up a dense gorge at Lyons Falls. This included a vertical wall scaled by climbing roots. I noted however the trail beginning to get muddy when there were signs of horse tracks. I wondered how this would be on the next loop after some 700 runners (also from 50 mile and 26 mile races) passed through. A few miles after the Covered Bridge AS (mile 14.8) I strangely entered a low funk, and I was aware enough to wonder why I felt so bad. My stomach was upset, I needed to stop to alleviate that feeling, and I was just overall fatigued. 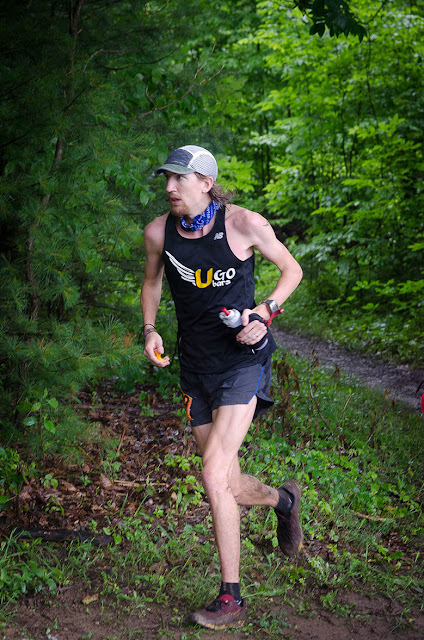 I thought for sure that Nate would be running up behind me but after the two longest sections between aid on the course (5.6 and 6.9 miles) I ran into the Mohican Campground AS (mile 27) feeling lousy in 4:05:00. My dad asked how I was feeling and I said I wasn't feeling as good as I had hoped to at this point in the race. Being just a fourth of the way through 100 miles and feeling bad isn't necessarily a great sign. But, I've been through this before so I just put my head down and headed out for the second loop, still in first place. The aid station stop must have done the trick because once getting back on the trail I regained my energy and form. Like the start of the race, the first 9 mile section really lifted my spirits. It was only 9:30am so I enjoyed a forest waking up, now all to myself. This first section of trail also has a nice flow that I am accustomed to training on in SE Ohio. As I made my way through the back section of the course at Lyons Falls the trails were much different than the first time around. At this point it had been raining since the race started, very hard for a couple hours. The trail was muddy and slick, and sure to only get worse on the 3rd and 4th loops. I reevaluated my pace, and the safety of how I trampsed down the trail because I imagined this would certainly play a large part in finishing times for not just me but everyone who was racing. As I popped down over Pleasant Hill Dam (mile 41), I noticed a lot of people hanging around looking over the spill way. There were a couple dozen search and rescue workers scouring the river in boats, along the shore, and on ATV's. At the next aid station I learned 3 high school aged kids had jumped into the spillway the day before and two had died and one rescued. They were searching for the body of one. This shook me a bit, and I thought how selfish it was that there were 700 runners out doing something they enjoyed while we ran past family members watching to see if their sons body would be found. I felt a bit guilty, and I definitely reminded myself to keep perspective and that what I was doing was voluntary and how I couldn't take it for granted. This helped in the low moments. Once again, as I finished the loop, I was in a low funk. 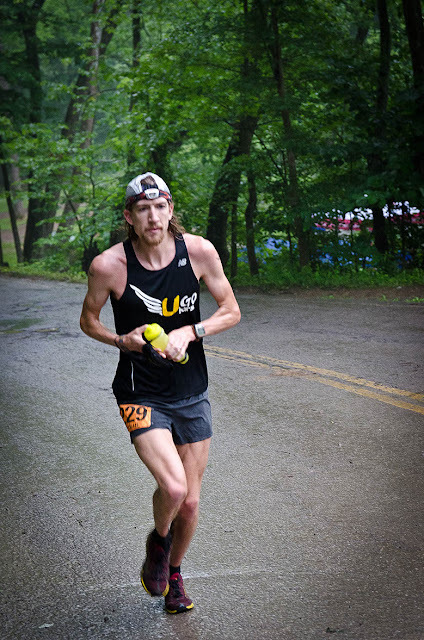 I was still leading going into the Mohican Campground AS for a second time (mile 54) but as I switched out gear, Nate came strolling into the AS as well. He wasted no time and was out before I was. I had led from 10 to 54 miles, but it was apparent that my slow second loop (4:55:00) was not just from the mud. Nate caught up a lot of ground on me in the second loop. I headed out still feeling low, and unsure of whether or not I would see Nate again. Loop 3 was grind time. Mentally, I was happy to be over half way through with the course and only have the 2 short loops remaining (46 miles). I was also looking forward to connecting with my pacer at mile 62. Nick Reed traveled all the way from Lynchburg, VA just to pace me. I first met Nick when I was teaching at Ohio University and he was one of my students in a Trail Running class. He is from Ohio but has since moved to Virginia for a job, and is a strong trail runner with a couple 50 milers under his belt. It was amazing for him to be so supportive of my race and being fine with a long drive to Ohio for the weekend. I didn't feel as good on the first 9 mile section of the loop as I did on the first two loops. I could tell I was losing ground on Nate. 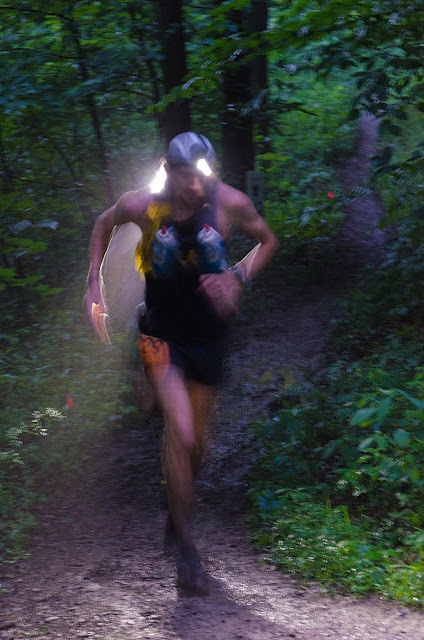 Coming into the Fire Tower AS (mile 62) to meet my crew I learned I was about 5-8 minutes behind the leader. In a way I was relieved to hear I was still within 10 minutes of Nate, and hoped that having Nick join me would boost my energy and focus. It took a little time to regain strength but having Nick there to chat with and keep me honest started giving me more of a drive forward. The mud was worsening on the course, and the pace was slowing, but I could tell that my legs still had a lot of energy left and I was ready to "be on the hunt." Running out of Covered Bridge AS (mile 65) I was ready to tackle the section of trail that had been hardest for me all day. This is why I chose Nick to pace me during the last 15 miles of the loop, and was planning to use him again on the last 15 miles of loop 4. I didn't see Nate until shortly before the Hickory Ridge AS at mile 71. I knew I was running strong leading up to that point but I was actually surprised to see him so soon. At this point, I was ready to strategize and make the right decisions. After talking it over with Nick I decided to hold back as much as I could and wait to make any drastic move on Nate and after initially spotting Nate and his pacer through the trees ahead, I held back to the point for them not to see me. I am not sure how long I went without being detected by Nate and his pacer, but eventually as I purposefully walked into Hickory Ridge AS Nate was too close not to catch. As he took his time in the AS, so did I, because I felt it was too early to make a push for first place. So after Nate left, I continued to make sure I was properly fueled and left some 30 seconds after. At this point, I sensed I was feeling stronger, but I still felt it was too early to make a move for first. I shadowed Nate the next section onto Mohican Campground AS. He was always in view ahead, and occasionally I would be right behind him, and sometimes I would drop a little ways back. 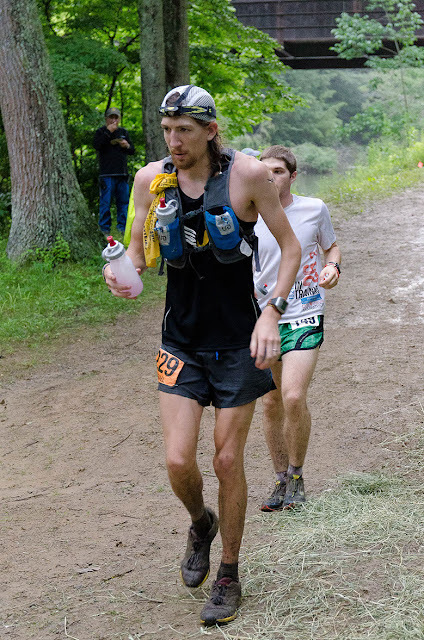 It was fun for me to be in this position to "race" 100 miles 3/4 of the way into the race, and I liked trying to determine what was in my competitors head and how he was feeling. Finally, as we came within 2 miles of the final loop, and popped out of the trail onto a gravel uphill, I pulled even with Nate as we power-hiked. It must have been a great scene, with Nate and I grunting up the hill, and our pacers flanking us on our outside. I actually felt good enough to be running up this hill but remained patient. We remained side by side into the Mohican Campground AS (mile 78). 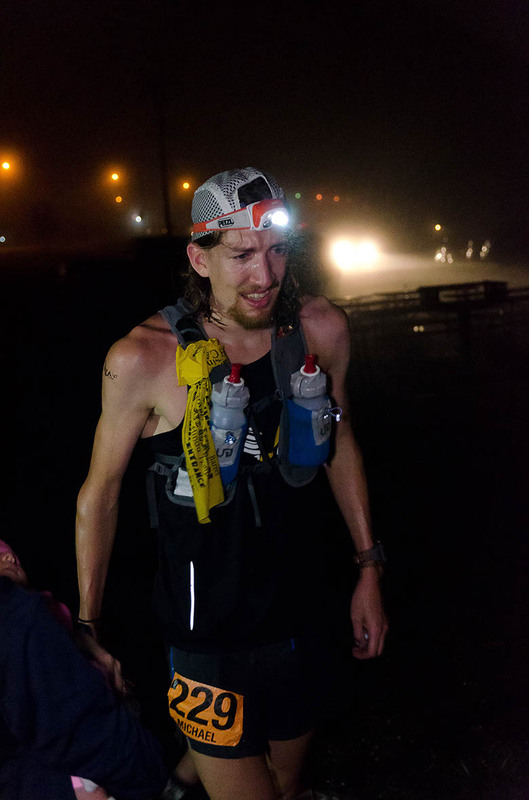 I am an emotional runner, especially in 100 milers. This can either be a strength or weakness depending on where my mind is. A lot of thoughts pass through my head in the darkest moments of 100 miles and it is how I manage them that dictates how well I move on. It becomes less about the physical ability and more about your mental strength of being able to propel your body forward. So when I headed out for my final loop of 22 miles of Mohican, I reached in for strength, sometimes even speaking out loud to myself. I thought about my dad who was there crewing with the rest of my family - he was 4 weeks into daily chemotherapy and radiation treatment for colon cancer that had been diagnosed in May. The mental and physical struggle he had to be enduring was unfathomable, but still continuing to stay strong and continuing normal activities. I thought about my 2.5 month old baby girl who was with Bobbi following along the course - I drew inspiration from seeing her beautiful little face at the crew points. I was in the lead now. Nate was walking out of the aid station and I ran by him into the trail. I decided to go without a pacer until the last 15 miles of the course so I was alone. I also made a decision at this point to push hard and go for it. Since my legs were still feeling fresh I told myself that the more places I ran, those were moments that I was either maintaining or gaining the lead I had. So I ran. This 9 mile section through the loops first two aid stations became the sweet spots on the day for me. I ran every step from the Campground AS to the Fire Tower AS at mile 86. This was actually more running in this section than I had done even on the first loop of the race. When I arrived at the Fire Tower I learned I had been 5 minutes ahead of Nate at the previous aid station so it was reassuring that I had gained 5 minutes in 4.5 miles. I knew that lead had not been cut into on the next section to the Fire Tower AS because I had kept a similar pace. 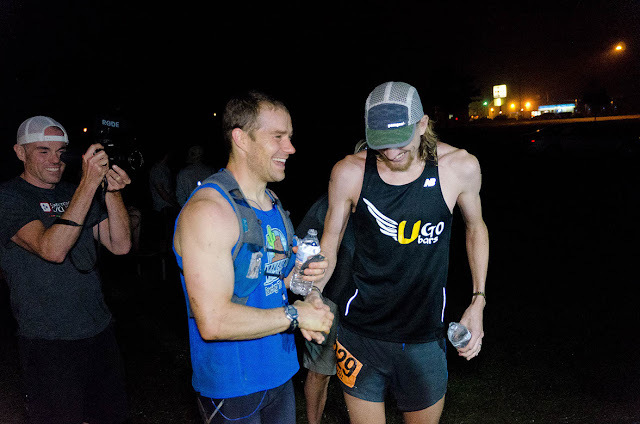 Now I was able to pick up Nick again to run the final 15 miles with me and knew that if I just continued to do what I had been doing, I could close this race out. The final 15 miles was mainly uneventful. It is not that it came easy - I was hurting for sure - but it was actually fun. My mind was fresh, which was crucial, and that was enough to keep my body going forward heightened sense of awareness on all fronts. Darkness came onto the course, and our headlamps were switched on, and I plodded forward. I chatted with Nick, went through low moments where I was silent, thinking about all the things that help motivate and propel me forward in dark times. The mud was even sloppier on the fourth loop, which eased my mind in thinking that it would make it harder for anyone to run me down. There was just so much one could do in certain sections of the course that was muddy - so I made sure I was on the upper end of getting through those sections. I was never 100% sure I was going to hold the lead until about one mile before the finish when the course entered a back road and the final paved walking path. I had Nick looking behind me for the last 5 miles "just to make sure." The last thing I wanted was to be working so hard and to be caught off guard by someone grooving in the last section. My watch had died a few miles before the finish line, so I didn't worry about my time or pace - I just had to run hard. I ran hard onto the road and walking path, through the tiki torch lit finishing stretch, and finally, was confident in my day. I crossed the line with many aunts and uncles, parents, grandpa, sister, my wife Bobbi and baby daughter in 17:59:15, a record on the current Mohican course! What a wonderful day full of much support. My wife and sister continue to be the go to best crews for many of my ultras, as well as my mom and dad who were at every stop. It was also extra special to have my grandpa and many aunts and uncles who are from the Mohican area to follow along and cheer from start to finish! Really, winning and having a successful day was just a little of the icing on the cake. Also a huge shout out to UGo Bars for their continued support and also to SOS Rehydrate. After sort of botching my hydration plan at Quest for the Crest 50k a few weeks before, I had a continual flow of SOS all day at Mohican which left my legs feeling great all the way to the finish! Thanks to Honeystinger energy gels for fueling all 100 miles - many gels and waffle crisps were consumed as my main food source during the race. And my sponsors Julbo and Swifwick Socks (still the best ultra sock - no blister even in mud caked and soggy feet, amazing!). I am also glad to represent the Blue Ridge Outdoor Magazine athlete team, and am grateful for their support of local athletes. I wouldn't have stayed as strong and mentally fresh as I did in the last 40 miles of the race with Nick there pacing me. He ran 30 miles just to keep me on track! It would have also been impossible without great aid stations (the 3 hot cheese quesadillas I had at Covered Bridge were awesome!) and all volunteers of the event. 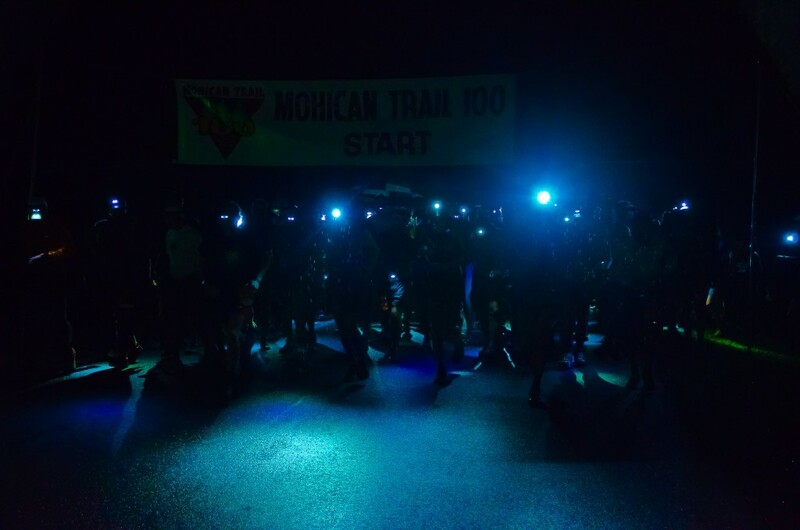 It was a great race and I am glad I was a part of Mohican.